There is an excellent review of Apple’s latest OS offerings, OS X Lion and OS X Lion Server on www.thetechscoop.net. The review is fairly comprehensive, hits most of the new features, and is relatively unbiased. Although I have not downloaded and installed OS X Lion or Lion Server, from what I have read, it appears that the Server version is improved in some areas. However, the interface is significantly dumbed down and stripped down to make server administration easier for non-admins. I mentioned in an earlier post that several key components have been removed, such as, MySQL and Tomcat. It also appears that many of the advanced server controls have either been eliminated from the GUI, or completely eliminated altogether. These changes are great for server novices who want to try their hat at server admin. However, I don’t think that this will bode well with many server admins in enterprise and research environments with complicated OS X Server deployments. I think many will choose not to upgrade. I understand that Apple is going after with masses to capitalize on the overwhelming popularity of iOS. They are building iOS features into the core OS and are bringing server administration within the reaches of the common user. I just don’t understand why they would choose to eliminate or severely hamstring many of the advanced server controls for more experienced admins. There is no reason that you can’t have both interfaces; Server made easy and Server on steroids. It seems that now we’ll have to hack at the command line more often to maintain the more advanced functionality of OS X Server. This move along with the recent overhaul of Final Cut Pro X, seems to suggest that Apple has lost touch with it’s core devoted user base, that has historically helped sustain their market share in key markets (creative pros, science, academics) for so many years. It appears that the mass-consumer market is now driving OS feature development. I can understand that for the core OS, but why for the Server version and Pro Apps? For anyone considering upgrading to Lion Server, check out this pdf from Apple titled, “Lion Server Upgrading and Migrating.” There are some significant changes under the hood to some of the core features included in Snow Leopard Server. Lateral Migrations: The migration of Lion Server to Lion Server is supported. Server app Services are administrated by the new Server app. PostgreSQL: MySQL is replaced with PostgreSQL. Tomcat: Support for Tomcat is removed from Lion Server. Axis: Support for Axis is removed from Lion Server. Mobile Access: Support for Mobile Access is removed from Lion Server. Print service: Print service is replaced with CUPS. QuickTime Streaming Server (QTSS): Support for QTSS is removed from Lion Server. As with any server upgrade or migration, make sure there isn’t any mission critical service(s) that will be broken or missing by migrating to Lion Server. The replacement of MySQL with PostgreSQL and the removal of Tomcat will probably affect a lot of folks. I recently wrote a post about using the Find My iPhone app to locate and recover my wife’s missing iPhone. What can you do if you don’t have an iPhone or other smartphone with location based tracking (GPS, Wifi)? Well, if your phone supports text messaging, you can simply send your phone a text message with a note to whoever finds it. Give them a phone number you can be reached at and you may be pleasantly surprised with a returned call! Don’t forget that you can also try the time honored approach of calling your lost phone from another phone. Someone might actually pick up on the other end! Anyone who owns an Apple iPhone needs to install and configure this app! When I first configured the Find My iPhone app, my initial thoughts were…this is sort of neat, but mostly a gimmick. Ok, so it lets me see the current location of my iDevices (iPhones, iPads, etc…). Is it really going to help me locate a lost or stolen iPhone? Well, the short answer is: YES! Over the past several months I’ve used this app to successfully locate several misplaced iPhones. A few weeks ago my wife couldn’t find her iPhone. We tried calling it, hoping to hear it ring, but after several tries…nothing. So I opened the find my iPhone app on my iPhone and voila, in about 15 seconds it told me that the phone was located in our driveway approximately where our minivan was sitting. The initial response was, “I’ve already looked in the minivan.” However, upon closer inspection, the missing iPhone was found under the center console. The real test came this last week, as we flew home from a short family vacation in Missouri. Our flight had a connection through Newark, NJ, and just before landing at our final destination in Boston, my wife realized she did not have her iPhone. Unknowingly to us, it had fallen out of her purse on the first flight. To complicate matters it was on airplane mode, so the cell phone radio was off. The first thing I did was open the Find My iPhone app on my iPhone and set the alert for her phone. I told the app to have her phone display a message as soon as it was found saying that it was lost and to call my iPhone’s number. I also told it to notify me via email as soon as her phone was located. We reported the phone lost with the airline and went home. I checked the app a few times that evening and the phone could not be located. Then at 11 PM that night, I received an email while sitting at my computer that said that her iPhone had been located. Before I could even launch the find my iPhone webpage, my phone rang. It was a cleaning lady on the plane in Indianapolis who had found the phone. She said as soon as she turned it on, it started making all sorts of noise and displaying the message that she needed to call me. She keep me on the phone as she walked to the Continental office to turn the phone in. While talking to her, I loaded the Find My iPhone webpage on my computer and watch as the phones location was updated every 30 secs or so. Continental made arrangements to have the phone on a flight to Boston the next day, where I picked it up at the airport. Overall a resounding success for the Find My iPhone app! 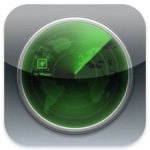 Visit the App Store on your iPhone, iPad, or iPod Touch and download the Find My iPhone app. Use your Apple ID to sign in and register your device with the service. Use the same Apple ID to turn on the app on your other iDevices. Now if one of your devices goes missing, you can use the app to attempt to locate it. For the location services to work, the device has to be turned on and connected to the internet either via Wifi or the cellular network. If it cannot be located, you can have it send you an email the next time it connects to the internet. There are also options to lock the device or to remotely wipe the device. These options may be handy if you are having trouble recovering a lost or stolen device from it’s new owner. Overall, I highly recommend this app based on personal experience. Download and configure it today!